"Forgery, From Fendi To Fossils"
I know that many of you have seen the typical fossil fakes that are so prevalent on eBay, in Tucson and Denver and at the NY/NJ show. We've seen reconstructed Mosasaur skulls, spurious Spinosaurus jaws, Croc skulls molded from mud and even fake Spinosaurus teeth. Let's face it, you can't swing a dead sabre toothed cat without hitting a home cooked trilobite at the Tucson show. 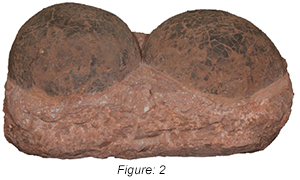 But what do you do when you see these franken-fossils? If you are like me, you just walk by and chuckle, never thinking that there would be any consequence to our industry. Who would actually buy these plaster trilobites and home made compilations of matrix and unrelated teeth? None of us are in the market for a Drotops Megaloplasterofparis, so when we see one, we simply look the other way, never thinking that any of this could affect the viability of the already precarious fossil market. But now, the fake fossil manufacturers have upped the ante and we may want to take heed. I've actually anticipated this for many years. About seven years ago, I met a rep from a large Chinese company that manufactures very realistic fossil replicas with "rockflour" and glue. They use gigantic rock pulverizing machines to make their rock flour, which they combine with glue to make some pretty realistic fossils that are quite heavy. Their replicas are molded from Chinese museum specimens, so they look and feel real enough to appear authentic. I really liked their products and I almost entered into an agreement with them for US distribution; but their shipping arrangements quashed the deal before it happened. I was left with no deal; but with the knowledge that it was only a matter of time before our fossil market was infiltrated with accurate, weight appropriate fossil counterfeits from China. Fast forward seven years and that day has come to fruition, and not without consequence to this industry. The company that I spoke with is quite honorable and continues to make it clear that their product is a replica; but unfortunately, others have explored the technology for more nefarious purposes. 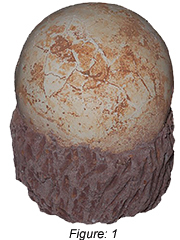 There are now a few manufacturers in China that are creating fake fossils, including eggs and claws. These are being sold as authentic and they are shipping to the U.S. from China and Malaysia. 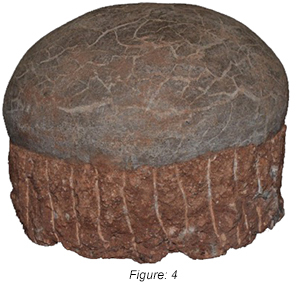 The sellers know that they will face no consequence for exporting these items, as they are not real fossils. 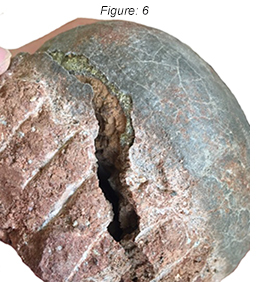 As we all know, China's cultural relics protection laws provide for some serious penalties for exporting fossils from China, so for years we have seen almost no fossils imported for sale from that area for obvious reasons. This new wave of Chinese manufacturing has filled that demand with counterfeit product that is being shipped with bogus claims of authenticity and no worry of prosecution. I obtained an early sample of one of these eggs that was shipped to me from an eBay seller in Malaysia and the fake matrix base smelled strongly of ammonia (see Fig.1). The shell appeared to be some type of plasti. After convincing the seller that I knew that the egg was fake and that I wanted it for research purposes, the seller confided in me that there were various types of replicas available in the Chinese market and that the high end ones would fool most anyone. He said that they were manufactured primarily by one company which he did not want to name. 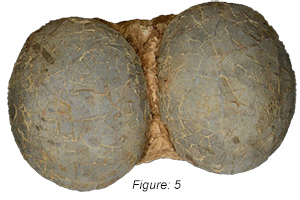 This company offers various levels of counterfeit Hadrosaur eggs that vary in price and appearance (see Figs 2, 3 & 4) . I've seen a few levels of these counterfeit eggs so far and the expensive ones (see Fig. 5) are quite convincing. I've seen one cut in half and it was constructed on a composite matrix pedestal, with a semi hollow circular form on top. The next layer was a green adhesive that was about .25 inches thick in most places (see Fig 6). Atop the adhesive was a composite layer possibly made with rock flour and glue that was constructed to look like cracked egg shell. 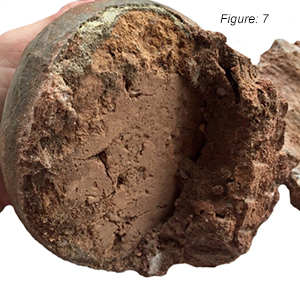 The center of the hollow matrix was partially filled with a mud like composite, (possibly added for weight) that in one instance was not fully dried (see Fig 7). One thing that I noticed was that the higher end, more expensive eggs are all completely intact, fully inflated, without compression or distortion and smooth and symmetrical. If you compare the pictures that you see on eBay, you will see the same exact shaped eggs over and over again, a true sign that they are spurious and created in some sort of manufacturing mold. Unfortunately, reporting these hucksters to eBay offers no solution. There is no law preventing the sale of fossil replicas out of China. Yes, it's fraudulent for sellers to purport that they are real fossils; but eBay makes its money on commission from sales; and they appear to look the other way. Incidentally, many of the sellers have added recent disclaimers that tell buyers that "while the seller believes their products to be authentic, buyers need to employ their own experts before purchasing, as there are no returns for any reason", (especially if you cut it in half and find it to be fake). Incidentally, all of this does not even touch upon the cocktail of toxic slop that may or may not be used to construct these replicas. So what can you and I do about all of this? I think that we need to educate ourselves thoroughly on the fake fossil market and help to network with others to spread info on the recent influx of these fakes. The more that buyers are educated, the less susceptible they will be to buying these forgeries. This will surely shrink the market for these questionable products. One way to do this is to join the Association of Applied Paleontological Sciences. We are a consortium of some of the most educated and talented individuals in this industry and, whether we are scientists, entrepreneurs or hobbyists, we are passionate about fossils. Our network of members has already begun to study and pass on the info about this new industry scourge and the theme of this year's guide is appropriately, "Fossil Fakes & Frauds". So, this year, as you stroll through the Tucson show and one of those plaster trilobites winks at you with his poorly faceted eye, remember, he's not as innocent as he looks. Bill Merz is the CEO of Documex, president of the Hiltonia Association, a fossil enthusiast, self proclaimed scientist and a recent member of AAPS.